I noticed the above yard addition to one of the many houses I pass on my way home from work each day. It snowed this past weekend here in Salt Lake and most of valley got around 4 inches of the wet, white stuff. And while I may not love the snow and cold, I do like when I see creative uses of it [including my own, which will make it’s return in full force all winter long] and this one in particular, is a great use of the snow. I say it looks like a cat, but my wife and her granddaughter say it started out as a polar bear, which I can see, given how it’s sitting. 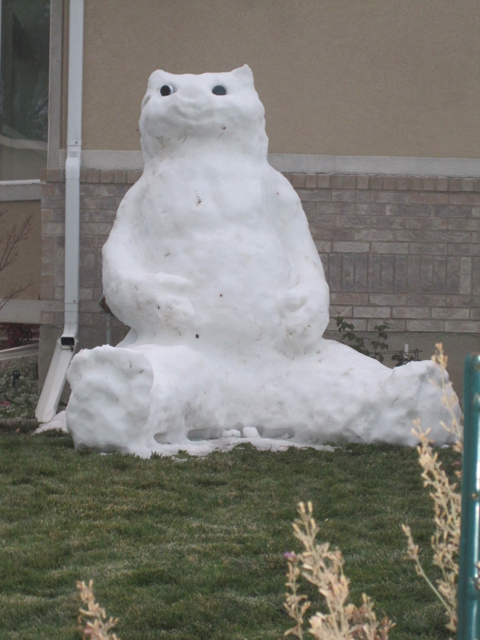 Then once the temps warmed up a bit, the nose fell off, along with bits of the snow melting off to transform the polar bear into a cat. Yes, this was very clever. I bet some kids and parents had a lot of fun making it. Oh, so *that’s* what snow looks like. I’d totally forgotten 😉 Mind you, Fall is certainly here with a vengeance, it was bloody 46 degrees this morning here in Phoenix. Brrrrr. Yes, the snow makes it’s way here early enough each year, although we do get some breaks. 46 is cold for Phoenix. 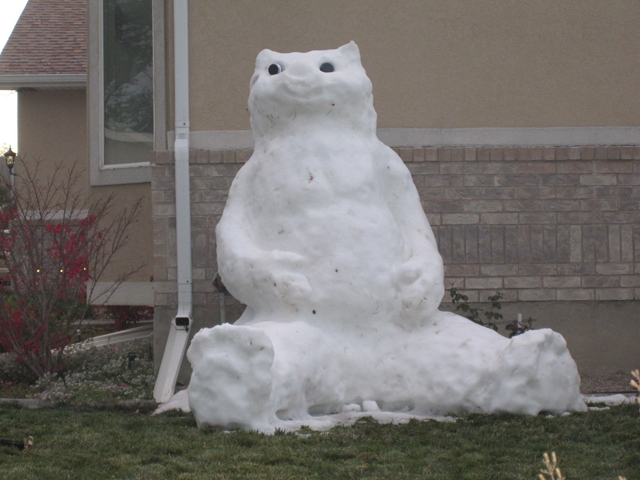 We always make a snow cat – easier for the kid, and it means I spend less time out freezing in the cold! A polar bear sounds like fun, though, and really wouldn’t be that hard. A snow cat does sound like it takes less time. I’m hoping we get some snow — had some a few years back, for one day. Melted by afternoon but it was fun with the kids. Always important to snap some photos when it happens, to prove to yourself it actually was real. I hope you get snow, too. Would be fun for Jaden and his dad to make a cool snow animal. Aww, I love love love it! Thanks for taking a picture to share with us! I heard it snowed in Chicago when I was in NYC but I missed it all. Well, given Chicago, I’m betting the snow will find it’s way back soon.